When Dublin mobs attacked German pork butchers, August 1914. | Come Here To Me! « Smithfield/D7 tours this weekend with Dice Bar. When Dublin mobs attacked German pork butchers, August 1914. War can bring out the worst in people, and not only those on the front-lines of battle. In 1914 there were a number of attacks in Dublin carried out against businesses owned by German nationals, with particular attention being paid to pork butchers in the city. Much of this violence occurred on a single night, with a number of premises attacked in Dublin on 15 August 1914. 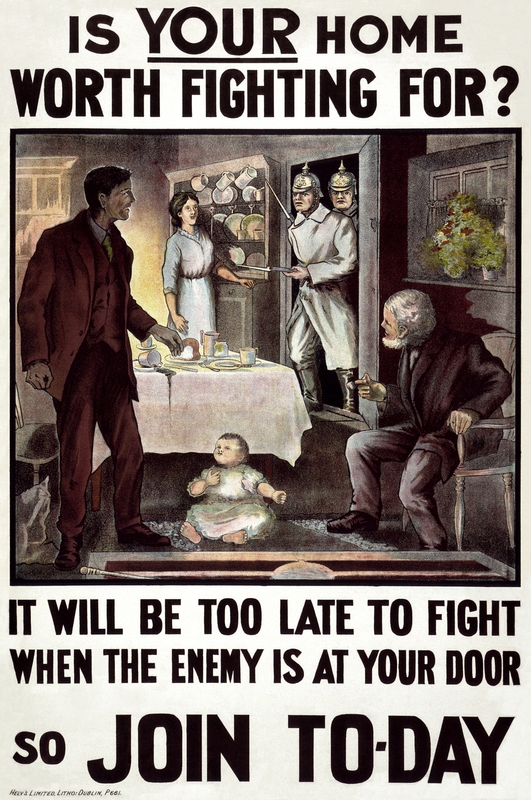 A popular recruitment poster from WWI asking Irishmen if their home was worth fighting for, and showing German soldiers entering a home. While there was considerable damage done to Lang’s premises, it was not the only one to be greatly damaged in the heat of the moment. Newspapers noted that George Retz’ butchers on the South Circular Road and Morton’s tobacconist on the same road were also attacked. It was reported that a sum of £20 was taken from the till of Reitz’ premises, while £14 was taken from the till of Lang’s premises. Highlighting the moronic and politically clueless nature of the attack on Lang’s premises was a report in newspapers on 20 October of that same year, detailing the fact his son Frederick Lang, aged 16, had died in the war effort in the service of British forces. His other son, Augustine, also served in the war effort with the Royal Marines at Antwerp. Report detailing the death of Lang’s son. What a sad story, Mr Frederick Lang senior was married to my great grandfather’s sister Margaret Kane from Cullenswood Dublin. Deborah, that would be Ben Kane Father of Benny ,Jack Madeline Mai, Cissie ,Phyllis and Jack ,his wife was Bridgid for Co TIPPERARY MAY HAVE BEEN kENNEDDY ?? on December 5, 2015 at 2:02 pm | Reply The “denizens of the slums” and looting during the Easter Rising. | Come here to me!